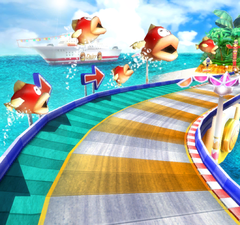 Mario Beach is a track in Mario Kart Arcade GP and its sequel, and serves as the second track in the Mario Cup. Overlooking this track is what appears to be Corona Mountain, suggesting that this track takes place on Isle Delfino. In the distance is the Daisy Cruiser. It is a very similar track to Mario Highway, however, instead of turning right at the first turn, the player goes straight which leads into another path. The player then goes down a big slide. After that is a sharp curve to the right which leads to some Piranha Plants at either side of the course. The track will then turn into a sandy road with Toads on either side cheering for the racers. The course will pass under Mario Highway and lead to a tunnel that turns sharply to the right. The tunnel will lead the player right into the finish line. In Mario Kart Arcade GP DX, the course is redesigned, becoming Tropical Coast. This page was last edited on November 12, 2018, at 23:41.